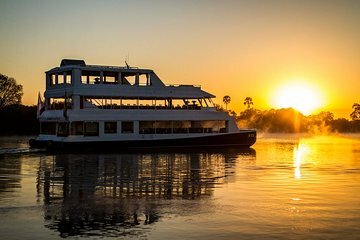 Sehen Sie die Viktoriafälle in ihrem besten Licht auf dieser Zambezi River Sunset Cruise. Wählen Sie Ihren Luxus, von der Standardtour mit Hors d'Oeuvres an Bord und Getränken bis hin zum unverkennbaren Oberdeck-Erlebnis - beide bieten den gleichen atemberaubenden Blick auf den Sonnenuntergang und den hochwertigen Service. Die Tour beinhaltet auch einen Abhol- und Bringservice von Ihrem Hotel in Victoria Falls. This was the first thing we did when we got to Victoria falls, and it was the perfect way to start. We were really treated well on the boat, and the peaceful trip, the views, and the wildlife we saw was great! DEFINITELY pay extra for the top deck. Well worth it! Amazing tour! A MUST for anyone visiting Victoria Falls! It was a beautiful evening with perfect weather and temperatures. Appetizers offered as well as drinks were very good. We did the Signature deck. Saw hippos, monkeys and an elephant. amazing ship and amazing cruise! !